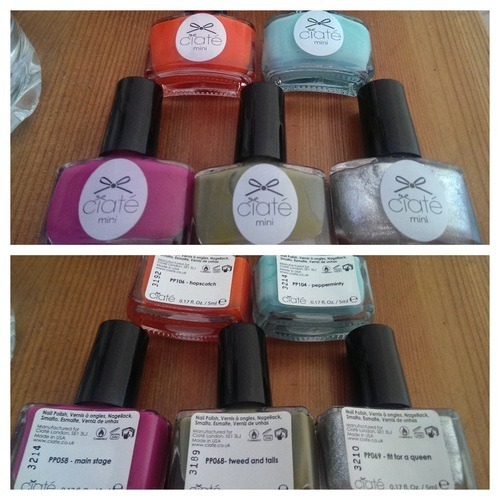 Today i’ve picked some of my favourite popping brights from Ciate to show you some simple nail art. 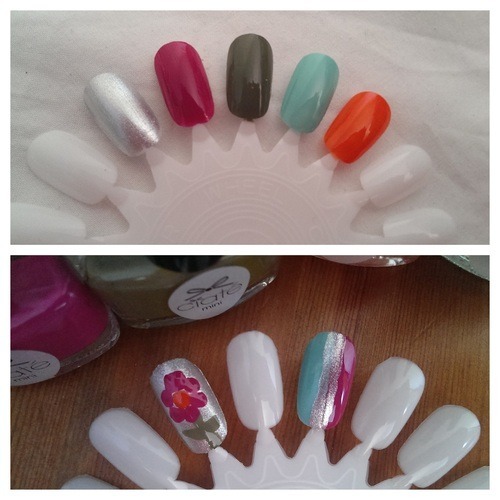 The shades i’ve used are fuschia (‘Main Stage’), hot orange (‘Hopscotch’), khaki green (‘Tweed and Tails’), metallic silver (‘Fit For A Queen’) and mint (‘Pepperminty’). This first look is a simple floral pattern. I’ve used two silver coats as a base, and let those dry. Next i’ve made a dot of orange in the centre, and drawn a quick stem with leaves using the green. Once they are dry, add the fuschia petals all around the orange dot- whatever size, and however many you choose. Lastly, i’ve done a two-toned striped look with a transparent silver stripe down the middle. First I painted two coats of the mint and let that dry. I then painted half the nail with the fuschia- this is a thick shade that goes opaque with one coat. Once the nail is dry, add a wide stripe of the silver lightly up the center- just one coat, as you want to be able to see where both the mint and the fuschia join together underneath. Tweet me if you try either of these looks! If you liked this post, please follow my blog on Bloglovin HERE! Previous WONDERING HOW TO GET FREE PRODUCTS TO REVIEW ON YOUR BLOG?